Update: See more information about XAML debugging here. - Open the "Exceptions" window (Debug/Exceptions) in Visual Studio. - Check the box to break on throw for this exception. 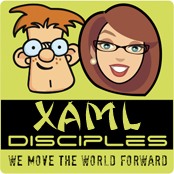 You'll find that the XamlParseException you catch is much more descriptive, and will give the correct position in the xaml file. Very cool, thanks for the feedback, Daniel! Another way you can do this is when the IDE breaks into the debugger and shows you the dreaded "Cannot create instance of 'Window1' blah blah" exception, click View Detail, and drill down on the InnerException property until you get to the real exception. That way, you don't have to add the XamlParseException to the caught exceptions, and you don't have to wrap InitializeComponent() in a try-catch. This method is essentially the same as catching the XamlParseException (it's exactly the same exception, obviously), except without the extra work. Yeah you're a lucky guy, doing WPF with VS2008 :-) Back when I wrote this, VS2008 was not really that ready yet, and your solution doesn't apply to VS2005. VS2008 makes programming and debugging easier, no doubts :-) Thanks for your comment. Actually, I get Patrick's solution on VS2005 v8.0.5. Laurent, can you not update fully and get it? What is the exact version number you use? Thanks for bailing me out of crunch situation. Actually i am developing an WPF application in crunch deadline situation.. I'm having this same problem - plus the generated method call to InitializeComponet() cannot be found with the error "Cannot resolve symbol InitializeComponent". Everything builds and when I create a new Windows project using the Extentions to VS2005 for WCF/WPF it runs just fine. Just can't resolve the InitializeComponent. I spent 12 hours today uninstalling everything from VS2005 to the runtimes for both .net 2.0 and 3.0 and still have the same problem. Anyone seen this or know what's up?